Not yet. My friend thinks it some kind of falcon. 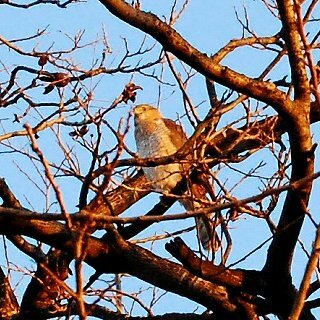 It appears to be a Cooper's Hawk. They prey on songbirds, thus the dramatic reaction in that last picture. Lovely sequence. At this time of year, I often see a merlin or a Cooper's harrassing pigeons near the Lamar/183 intersection. I'm finding the pictures a little confusing, and that could be all about angles and lighting. The Cooper's is an accipiter, noticeably long-tailed, and very orange in front (they come into our back yard sometimes, so I've seen them fairly close.) In flight, the wings are wide (though not as wide as most buteo hawks. In the flight pictures, the tail doesn't look quite right for a Cooper's, though the wing position is right (gliding/soaring with flat wings) and the wings look too narrow and pointed--though from the angle of the shot, that could be causing an illusion of narrowness. The best evidence for a Cooper's is what appears to be (not sure) the horizontal barring of the breast, rather than vertical marks as in the merlin. The best evidence for the merlin is that it's hunting in the open air going after a big flock in flight. Cooper's, like sharp-shinned, are stealth hunters, usually working their way in cover until they flush a bird and then going after it fast and furious through the trees and brush. (The Cooper's that comes to our yard is after white-wings that have come in to feed and water. It sneaks down the fenceline on the north and gets into the pecan or ash and just sits there while the other birds panic...and then they come back, and next thing I know it's got a dove. Although--birds in winter in different environments can behave different ways. Cooper's are significantly larger than merlins if that is the choice. Oops that was me I wasn't logged on. Merlins are only 12" long with a 23" wingspan. I guess that's not really so much smaller, but they really do LOOK much smaller. Maybe it's the head; merlins have sort of a squished head like a finch. The bird was pretty big. I first saw it when I was sitting in traffc quite aways away. I thought it might be a hawk. I didn't stop because I was on my way to pick G up. 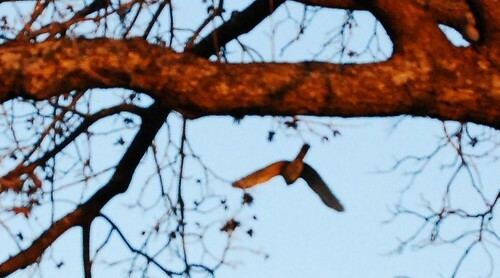 On the way back to the house, we drove a bit closer to the tree and G confirmed that it was a raptor-style bird. I dropped G at home, got my camera and went back. The bird was high in the tree, just past the limit of my camera/lens combo. I had to take the filter off the lens to keep the image from being too blurry. I used my monopod and leaned against a large truck that was conviently parked in the best spot for viewing the bird. It's feathers were puffed up against the cold and it seemed to be sleeping. The sun was going down, and after a while the bird started moving around. 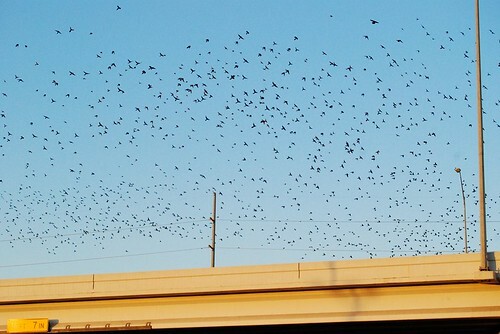 It moved to a slightly lower branch, took off, flew under the freeway and the cloud of birds in the last photo rose up from behind the overpass. It was pretty obvious that the birds had been spooked by the raptor. I was so focused on photographing the raptor that it took me a moment to realize that I should get some pictures of the fleeing birds. I didn't see the reptor chasing any of them so I assume it was off somewhere happily chowing down. All in all it was very satisfying. Can't tell size from the picture, and it's complicated by the gender size difference...with females larger than males. For instance, Sibley gives the wingspan of a Cooper's hawk as 31 inches. That's an average: according to Peterson, males are typically much smaller (wingspan ~27 inches) and females are typically much larger (wingspan to 36 inches.) Both Sibley and Peterson list 24 inches as the wingspan of a merlin...so a male Cooper's would have a wingspan not that different from a female merlin. The apparent length perched *would* be different by a higher percentage of the observed size (with Cooper's bigger)...but the birds you need to compare just do not sit side by side to make life easy. Lovely pictures and sequence, though. Sometimes little birds gang up on these big birds. I've seen crows go after a hawk in Prospect Park. The hawk left. And I think starlings do that too. Is that what those birds are that are flying away? They were escaping, see my description above. Great pictures! I never tire of looking at raptors, especially in flight. For two years we had Cooper's Hawks nest and raise their young in our yard. 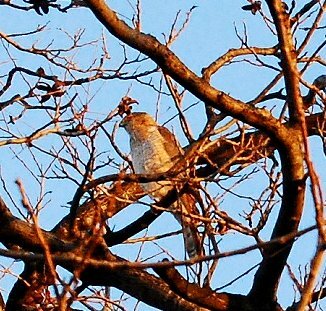 It looks like a Cooper's Hawk to me. The light red color in the front, the black cap, the red eye all look like Cooper's Hawk. I'll put some of my pictures up on matildasmom. Make sure you go over to matildasmom's lj and see the hawk pix there. They're nice.